Dan Sherman was trained by the US Air Force as an "Intuitive Communicator" – a high-tech telepath – and found himself in daily communication with two extraterrestrials as part of the US military's preparation "for a future time in which all electronic communications would be rendered useless". In this fascinating interview, Dan states: "If I were to make up a story, it would be a lot more elaborate than this. I want to stick to what happened to me, and let everyone else conjecture upon that. If I start conjecturing, then it sullies my credibility. I need to stick to the facts." So Dan tells it like it is, and refrains from speculation. His low-key, matter-of-fact presentation has great power in a field where sometimes stories can be dramatized and embellished. His book, Above Black, available here, is a straightforward narrative in which further details of the story can be found. It presents a concise, clear statement of one man's extraordinary experience. This is one of the cornerstones of Project Camelot's current focus on 2012 and the events that may surround it. We have heard from several independent and credible sources that a time will come soon when the electromagnetic grid will go down. There is overwhelming evidence that the US military were somehow well aware of this over twenty years ago… and that plans are now well advanced to deal with a serious situation about which the public are still being kept totally in the dark. 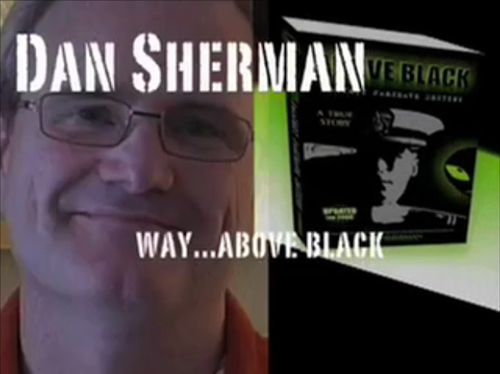 Click here for Dan Sherman's website, where his book ABOVE BLACK is available.